Microsoft is introducing CEO Satya Nadella to employees and other stakeholder groups in part through a comprehensive website, hoping for a fresh start with various audiences. REDMOND, WA: Microsoft is introducing CEO Satya Nadella to employees and other stakeholder groups in part through a comprehensive website, hoping for a fresh start with various audiences. Long-time AOR Waggener Edstrom supported the company's internal PR team with communications for the leadership transition when Microsoft named Nadella as its replacement for Steve Ballmer on Tuesday. The company also appointed John Thompson as its new chairman at that time. The India-born Nadella, who previously led Microsoft's cloud computing division and enterprise business, was named after a five-month search. At the same time, the company tapped Thompson to replace Bill Gates as chairman. Gates will transition to a technology adviser role. Outreach efforts include a page on the Microsoft website with detailed information about Nadella, including a “meet the CEO” section and videos with Ballmer, Gates, Thompson, and Nadella, as well as photos. 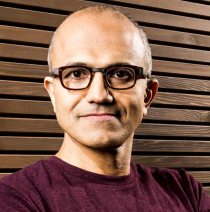 The page also painted a more personal side of Nadella, pointing out that he enjoys cricket and poetry. All other outreach materials, including the official press release, can be found on the page, along with separate emails to employees from Ballmer and Nadella. It also includes a webcast where the new CEO addresses the company's partners and customers. Microsoft is updating the page based on events related to the appointments. The company has also kept the public in the loop through “all the general social media channels,” Shaw said. While Ballmer said in a statement that Nadella is “the right leader at the right time” for Microsoft, analysts at FBR Capital Markets said in a note to investors that the new CEO was a “safe pick” in comparison to choosing an outsider. Last August, Ballmer, who took over the company in 2000 from Gates, said he would step down from his role. His decision followed the company's reorganization of its management, marketing, and PR structures. It also centralized its communications teams directly under Shaw last summer. In January, Microsoft reported that it raked in $24.5 billion in revenue and $8 billion in profit in the fourth quarter, bolstered by sales of the Xbox One and 360 devices.